You are here: Home » News » FERMA is 40! On October 20 in Brussels, FERMA celebrated its 40th anniversary. In 1974, six European risk management associations came together to give the commercial insurance buyer a voice. They created the Association of European Industrial Insureds (AEAI), which in time transformed itself into the Federation of European Risk Management Associations. Today FERMA represents 22 national associations in 20 countries and more than 4300 individual risk managers. 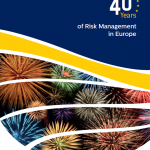 The 40th Anniversary brochure tells the story of FERMA through its presidents since the beginning and sets out the developing work of FERMA to support risk management and risk managers in Europe today and in the future. The Federation of European Risk Management Associations (FERMA) and the European Confederation of Institutes of Internal Auditing (ECIIA) have responded to increased EU requirements for more corporate transparency with a new joint guidance document on the 8th Company Law Directive launched today at the FERMA Seminar.